Discussion in 'Star Trek: Discovery' started by Tuskin38, Mar 22, 2019.
jespah, King Daniel Beyond and saddestmoon like this. Are those...nanoprobes...I see on the hand of whoever is strapped into that chair? They show a spaceship landing and then 2 people in uniforms. Uniforms looked vaguely Romulan, but I hope that is not the case. I'm pretty sure that's a Klingon Bird of Prey, and those are Klingons. Noname Given, Tim Thomason, Ovation and 2 others like this. Those are Klingons, and that's a DSC Klingon BoP. Judging by the fact they're being looked at through a HUD, I think it's a flashback (or maybe a recording from the Red Angel suit) to the attack on the Science outpost Burnham and her family. was at. That's probably just Burnham recovering. It is definitely Caucasian and looks to me to be very Masculine in nature. Plus the sleeve seems to be a Section-31 uniform. So Michael Burnham will be the Red Angel. She wears the suit in this. Isn't it weird that we apparently see footage with the suit HUD system displayed over it looking at the person wearing the suit? How does that work? maybe it comes with a drone? 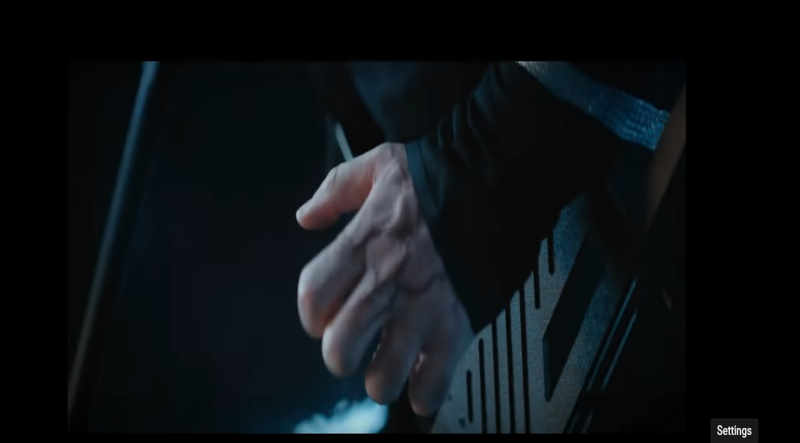 I thought perhaps Spock's hand with green veins. PiotrB and cultcross like this. The needle in the eye, plus now the hand with the veins does open that possibility. Personally I would prefer they do not go their. cultcross, jespah and King Daniel Beyond like this. I sincerely doubt it. People keep screaming Borg whenever we see anything remotely cybernetic. BeatleJWOL, cultcross, CommanderRaytas and 1 other person like this. Plus, the Borg are already thousands of years old when we first met them. There's time travel for Control to make that happen in the past. Please no on the Borg. Don't want any Borg, either, but I won't let it ruin the fun for me if it happens. BeatleJWOL and jespah like this. If all sentient life in the galaxy is gone in Control's future, it means it...erm...assimilated Borg tech. Well, that's what they want you to think. Also: This is a time travel plot with tech which could easily end in them retreating to the past of the Delta Quadrant. I was thinking Genesis Of The Borg™ after last week. An out of control/corrupted AI, plus time travel, plus nano-probes. All that has to happen is, one of those probes containing a messed up version of Control falls back in time far enough, lands on one specific planet in the Delta quadrant and tries to convert the poor suckers that find it. Species 001. Rhodan and King Daniel Beyond like this.